Colour psychology is not a new phenomenon, but have you ever thought that a colour you choose for a room might actually affect how you behave in it? Ask yourself: is the colour you've chosen for your bedroom walls keeping you awake at night? Conversely, could the colour you've picked for your kitchen not just please you visually, but make you a better chef, too? We all know that colour affects our mood and wellbeing, but it may be that the colours we have always traditionally thought of as the most appropriate for home decor are not best suited to a specific room's purpose – and that, informed of the right choices, we could change the way we decorate, and feel. So, helped by a recent survey of 1,500 people by Dulux, we set out to find which colours to use where for the perfect lifestyle/mental health we all aspire to. The survey reveals some surprising facts about the effects of different colours on how we use our homes. Where it comes to sleep, for example, Brits with green bedrooms get the most, while red walls keep the most number of people (50 per cent) awake. On the other hand (and somewhat puzzlingly), red was named as the most relaxing colour for bathrooms, with 69 per cent claiming that a red bathroom made for the most soothing bathing experience. Thinking of painting your living room purple? Beware, as this is the colour lots of people claimed made them addicted to watching TV (The Color Purple, by any chance?). Green living rooms, on the other hand, were most likely to help people focus on work. 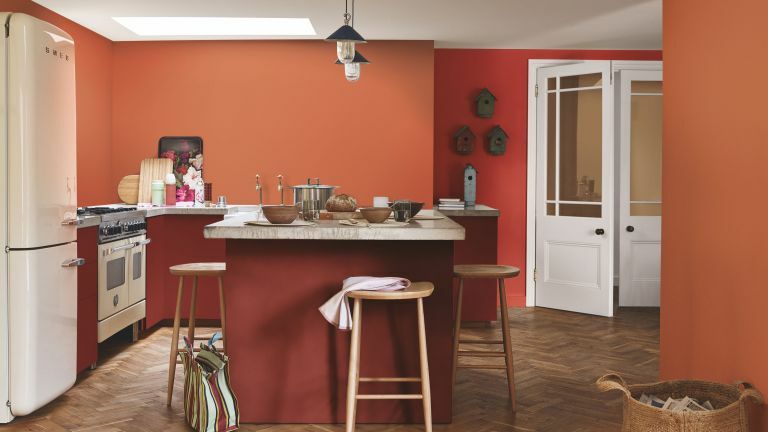 Orange was the overall winner for kitchens, with 61 per cent of those whose kitchens are painted this colour saying that the kitchen was the heart of their home, and 12 per cent even claiming that this positive colour made them better cooks.